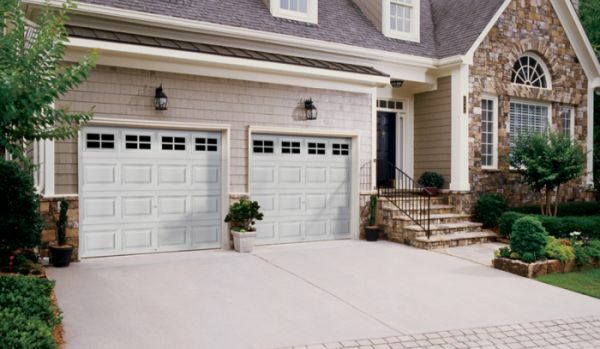 Homeowners often don’t think about how valuable their garage doors are. From helping to keep your home more secure to saving you from running out in the snow or rain to get into your car. Additionally, your garage door works hard every day as most homeowners open and close their door multiple times a day, putting wear and tear on it over time. But, what other factors affect your garage door? Like other elements of your home’s exterior, your garage door sees effects from the weather throughout the year. Below, we’ll discuss the two main ways weather affects the operation of garage doors and their openers. Extreme temperature changes, especially from cold weather, affects garage doors. When the temperature drops, the different components of your garage door’s mechanisms are affected — such as the springs. They are more likely to break during the wintertime than they are during the summer. This is because cold temperatures make metal contract. Applying lubricant to all metal parts of your garage door system is a great way to prevent metal from contracting. Cold weather also brings snow and ice in many areas. If water pools in the gutters around your garage door and other areas, that water will freeze and potentially damage the door. Sunlight is the main explanation of how summer weather affects your garage door. The glare can trip up the sensors, making it think an obstacle is blocking the door when nothing is. Sun exposure can also cause the color of your garage door to fade over time, depending on the material type. Precipitation from rain, snow and ice all affect your garage door, too. If you have a wooden garage door or if any of the exterior framework is made of wood, any moisture will cause the wood to expand. During that process, the expanding wood can put stress on other parts of the mechanism and lead to breaks. Even a humid day can cause problems. High humidity can affect the electrical components in the garage door’s mechanisms, like the sensors and wiring in the motor. If that humid day turns into a spring or summer thunderstorm overnight, the lightning may cause a power surge in your home’s electronics that includes the garage door. We know no one can control the weather, but you can do a few things to lessen its effects on your garage door. If you love the look of real wood but don’t want to deal with its maintenance needs, choose a garage door that closely mimics the look of wood, like the Canyon Ridge Ultra-Grain door from Clopay. During the wintertime, you should routinely inspect the garage door’s springs. Getting them fixed or replaced before an actual breakage will be a much more affordable repair and prevent other damage to the door. In the summer, clean your gutters of leaves and other debris. This allows the water to be directed away from the home, instead of building up around the garage door. We have an excellent selection of beautiful new garage doors from Clopay, helping you find the perfect fit for your home. Please contact us today to learn more or to get the process started.